How many managers, players and coaches out there are scrawling down their team’s line-up and formation on scraps of paper only to have them look messy and badly proportioned? And this is before they realise they have to cross through it all and begin again when their thinking has changed! This sort of behavior needs to stop – that’s where www.lineupbuilder.com comes in. It’s a free online web tool that has been developed to allow users to produce professional looking line-ups as simply and easily as possible. We’ve put together this video guide to show you exactly how it works. Don’t worry though, we’ll still take you through it below as well. If you’ve ever played Football Manager then the line-ups are going to look very similar to that, and all for very little effort. Lineupbuilder.com lets you create teams quickly. Like this 5-a-side legends team – we’ve had to put Zidane on the bench! It caters for different numbers of players, so you can select anything between 5 and 11 – making it easy to make line-ups for 5-a-side, and 6-a-side; right up to full 11-a-side. You can select a number of different formations as your starting point (just for 11-a-side) but then have freedom to move players around by simply dragging and dropping, and even to add arrows to illustrate attacking or defensive directions for them. Because you can simply drag and drop players, it makes it easy to experiment with different formations and tactics. It’s completely free to use, to the point of not even having any advertising on the webpage (although those who want to express some appreciation to the maker are invited to make a donation). It’s highly customisable – you can insert your own player names, numbers and even pick your own team colours. 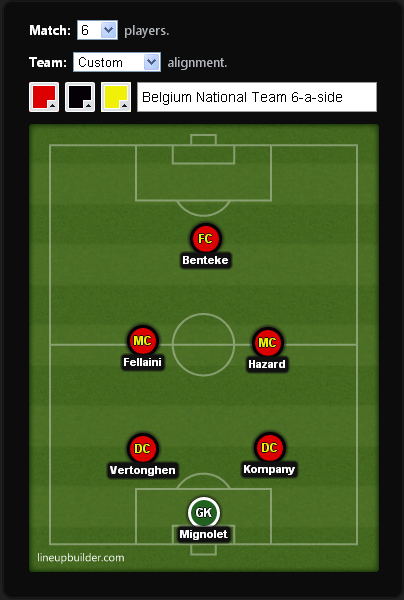 A possible Belgium 6-a-side team, created in Belgium colours. This would give any team in the world a run for their money! It’s hard to knock a completely free tool, but there are just a couple of things that could take this from being a very handy tool for playing about with formations, to the last thing you’ll ever need to draw up a line-up. There is no obvious way of exporting a finished line-up. It would be great to have a button which allowed you to press the finished lineup as a jpg, which can then easily be shared, saved or e-mailed. The only way of sharing at the moment is to either share a web link (which people don’t always want to click on) or to take a screen print, as we’ve done to put our line-up on this site (a bit of a pain). The site isn’t yet compatible with some browsers. Internet explorer isn’t supported and we were unable to get the site working properly on an android phone. The background for the pitch is always an 11-a-side grass surface. Now this is just being greedy, but it would be great to have the option to have a specific 5-a-side pitch, and also indoor 5-a-side and futsal markings for lovers of these formats. A team of 6-a-side rogues. One to strike fear into any opposition. Overall lineupbuilder.com is a really nifty tool and one that is fun to play about with. If some of the frustrations can be fixed – particularly some way of making it easier to share a finished formation as a picture rather than a web link; that would really make this the finished article. As it is, it’s already a great tool that we recommend having a play with. What do you think of the three teams we’ve produced using lineupbuilder? Think we’ve left someone out – think you could do a better one? Feel free to share your line-ups with us and we might even publish some of the best ones.